The outlook for the Manchester Walking Football February 2018 over 60’s session of the Spring League didn’t look too hopeful on Wednesday evening with a sudden snowfall covering the pitches. Early morning texts sounded good with the positive news that the pitches were playable. Our friends from the Fylde coast and Yorkshire were given the decision early in order to make their travel arrangements. However, upon arrival at 09:30, we discovered that the surface was covered in icy snow. Fortunately, the covering did move when a ball was kicked, so we decided that with the sun shining, another hour or so may make a big difference. As it turned out, when kick off time approached, the snow was almost completely gone. With Bolton Wanderers B and Nash Bees dropping out of Division 3 and Preston North End Senior Whites joining us it meant that Division 3 was down to four teams. This entailed twenty minute games in that division in order to give players an hours playing time. Unfortunately, when compiling the fixtures for this Manchester Walking Football February 2018 session, I forgot about the added time in Division 3. This resulted in turning the playing schedule out of sync and some teams had over an hours wait between games, which of course isn’t unacceptable. Apologies for those who suffered as a consequence, I hope it didn’t spoil your experience of the day. It was entirely my fault and will be rectified in March if we don’t add another team to that division. In Division 1 of the Manchester Walking Football February 2018 session, we had promoted team AFC Blackpool Senior Seasiders replacing the relegated Rochdale Striders. The Seasiders got off to a decent start with one win, two draws and one loss, leaving them mid table on five points. In my opinion they have the best walking football goalkeeper I have seen in Steve Hyde. In the game versus Vintage Celtic he must have made six or seven tremendous saves that were goal bound. He even saved a penalty and admitted that they had ‘got away with murder’ in that game. To me if he isn’t a nailed on certainty for the England Over 60’s National side, then whoever gets the job must be a sixty odd Gordon Banks clone. The Autumn league winners, Rochdale AFC Strollers started badly with a 0-1 defeat to Nash Amblers. However they soon got back on track with three wins and once again find themselves top of the table with nine points. Nash Amblers are in second spot on six points and what I do find difficult to understand is how Chadderton FC WF only gained three points. For me, they are the best passing and moving side in the league but seem to have difficulty putting the ball in the net. I watched their game versus Nash Amblers and they were far the better side but only came away with one point. My own team, Vintage Celtic, are propping up Division 1 on a measly two points. I am the first to admit that we are now nowhere near the team we once were, due to long term injuries, players retiring or not accepting the ‘no running, non contact’ ethos of walking football and general unavailability. Hopefully this will alter later in the year when a couple of players reach the age requirement but by that time we will in all probability find ourselves in Division 2. Division 2 of the Manchester Walking Football February 2018 session saw Roach Dynamos heading the table on seven points with two wins, a draw and one loss. Only two points separate the first four teams in this division. In second spot, Fleetwood Town Flyers are on six points with one win and three draws. Bolton Wanderers Walkers, formerly Bolton Wanderers A, have exactly the same points, game record and goal difference as the Fleetwood side. Newly promoted Wakefield Wanderers are on five points with a win, two draws and a loss. The most surprising outcome in Division 2 is seeing Rochdale Striders bottom of the table, with only one point from a draw and three losses. Although being relegated from Division 1 in the Autumn, I always thought they were a difficult side to beat. Perhaps it just goes to show the strength of the teams in the Greater Manchester Walking Football League, where to be honest not a lot separates most teams involved. A big welcome to new boys Preston North End Senior Whites, who join us in Division 3. One point separates the top three teams in this division. Bury Relics head the table on five points with a goal difference of three after a win and two draws. On the same points and playing record are Third Space Seniors WFC with a goal difference of two. 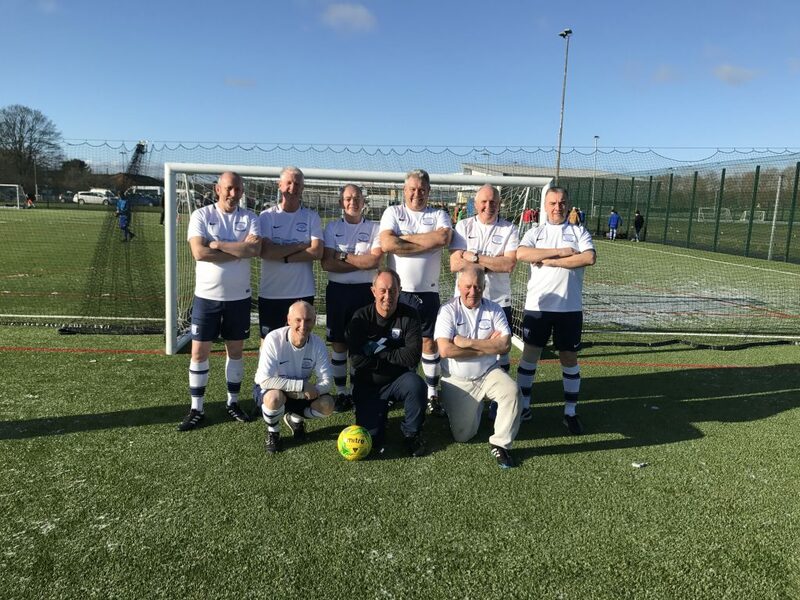 Preston North End Senior Whites had a decent introduction to the Manchester Walking Football February 2018 session with a win, a draw and a loss to put them third on four points. Maccabi Old Codgers, relegated from Division 2 in the Autumn, picked up one point from a draw and two losses. I did catch some action from two of their games and have to say they have definitely improved and were unlucky not to add to their points total. One wrong refereeing decision cost them points and you have to sympathise with them over that. The two teams relegated from Divisions 1 and 2 in the Autumn 2017 league, Rochdale Striders and Maccabi Old Codgers respectively, now find themselves bottom of their new divisions. Apologies to the teams in Division’s 2 and 3 for the limited input but with being involved with my own team, I don’t get to see much action apart from Division 1. All the results and tables from this Manchester Walking Football February 2018 session, together with all the historical results and tables since the league started are on our FA Full Time website HERE. The Golden Boot and Golden Gloves awards are on again for the Spring 2018 league. Off to a great start for the Golden Boot is Rochdale AFC Strollers striker Val Mears on four goals, two ahead of another three players on two goals each. Three keepers did not conceded any goals in this Manchester Walking Football February 2018 session. Another five have only conceded one goal each. It’s certainly going to be interesting to see how this progresses in future months. We are entering two teams in the forthcoming Walking Football Association National Tournaments, an Over 60’s side and an Over 65’s side. Please like our Facebook page. These teams will comprise the best players from our local teams. AFC Blackpool Senior Seasiders, Fleetwood Town Flyers and Wakefield Wanderers are entering under their own banners. Thanks to Peter Thomas of Fleetwood Town Flyers who once again provided cakes for the after session refreshments. Surely another collection day for Macmillan Nurses is due Peter, as I am sure the players would once again contribute generously. In October £135.92 was raised for this excellent cause by our teams. Thanks also to Paul Gardner for his match day duties and Barry Woodburn for his efficient work at the registration desk. Our new Over 65’s League starts on 15th February and the deadline for entry is the 8th February. We have seven teams committed at the moment, so if you haven’t entered yet and would like to do so email me HERE. Yet another superb day of walking football organised by Bill and his colleagues. It doesn’t come much better than this. Great set of like minded teams competing but in a very friendly atmosphere. Let’s hope this continues and I’m sure Bill and the others will ensure that it does.